Young and dumb is no longer an excuse. A Canadian youth hockey team forfeited the rest of its season this week following social media backlash and death threats after a video surfaced of players dancing to music from an indigenous electronic group led to accusations they were mocking indigenous culture. “We could not guarantee the safety of our players, the families and the teams that we were going to play against because of the threats that were made against the team,” Shane Kearney, a parent of one of the players on Fort McMurray Midget ‘A’ Junior Oil Barons in the Canadian province of Alberta, said in a Feb. 13 statement posted on Facebook. The parents decided to forfeit the team’s remaining six games, and the team has also paid $2,100 in penalties for dropping out, the Calgary Herald reported. An uproar ensued last month when a video showing players dancing to the song “Electric Pow Wow Drum” by electronic group A Tribe Called Red made the rounds on social media. 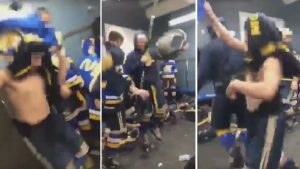 It was uploaded to Facebook and features one player banging a hockey stick on a garbage can lid similar to a drum and two others dancing while the rest of the team shouts and laughs.